More than 30 million Americans suffer from varicose veins and the more serious form of venous disease called Chronic Venous Insufficiency (CVI), yet only 1.9 million seek treatment each year (1,2,3). 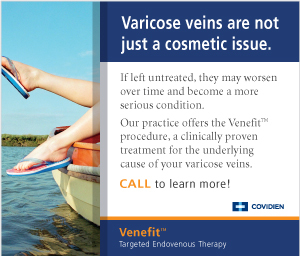 If the disease is left untreated, varicose veins can progress to become CVI with symptoms that worsen over time. Fortunately, diagnosing and treating this disease early can halt its progression. At the Cardio Metabolic Institute, we conduct in house procedures to treat CVI. See the treatment page for more details on the exact methodology, and call our office at 732-846-7000 for more information or to schedule a consultation. Take our self assessment survey to see whether you may have CVI and qualify for treatment!